The following German performance tables refer to the Bf 109G when configured with various kits to enable it to serve in different operational roles and as fighter-bomber, heavy fighter, short range fighter-recce (G-2/R2) or long range fighter-recce (G-4/R3). 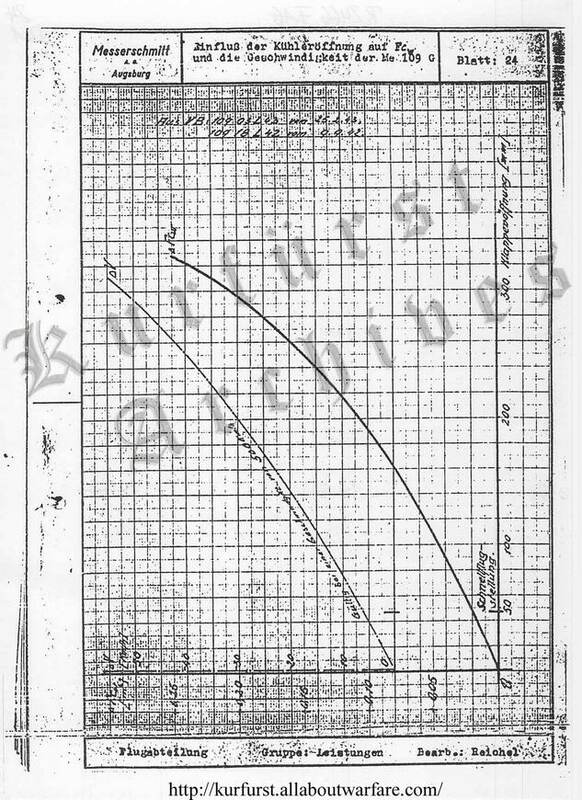 The datasheet appears to be calculated for the individual configurtions and subtypes on the basis of the avarage performance obtained in earlier trials at the Erla factory with 13 serial production Bf 109G fighters in early 1943. These avaraged 652 km/h at 6700 m altitude, the same as given in the table below for the G-2/R2 fighter-recce variant, which is the closest configuration in the below list to a clean fighter configuration without additional equipment. It should be noted that basis Erla trials were performed with the radiator flaps were considerably more opened than the standard 'Schnellflugstellung', ie. 120 mm wide open compared to the standard of 40-50 mm. This would result in an apprx. 12 km/h lower speed compared to the standard way of measuring maximum level speed. It is to be kept in mind that all perfomance values noted below refer to the Bf 109G when carrying various extra equipment, i.e. bomb(s), underwing cannon gondolas or cameras. The performance figures of the so configured subtypes due to the added weight and drag resulted in performance loss compared to the clean Bf 109G, configured for air superiority fighter role. - 8 kph loss in speed, additonal 215 kg for take off weight. - 40 kph loss in speed, additonal 280 kg for take off weight. - 24 kph loss in speed, additonal 240 kg for take off weight. - 26 kph loss in speed, additonal 500 kg for take off weight. The document does not list losses for the Rb 50/30 camera installation. This was installed in the fuselage behind the cocpit, and a small screening plate was added on the bottom of the fuselage (to keep the camera lenses clean from possible oil leaks from the engine) and added a small amount of drag. The weight of the installation from the clean fighter loading figures appears to be apprx. 80-90 kg. The official performance specifications for the G-1 (which applies to the very similiar G-2, G-3 and G-4) at Steig- und Kampfleistung was noted as 537 kph at SL, and 660 kph at 7000m. Take off weight given was 3037 kg (May 1942), while the Leistungzusammenstellung Me 109G report (January 1944) gives it as 3050kg. An interesting comparison can be made with the G-2/R2 fighter-recce, which is the most comparable configuration to the clean fighter versions, being identical apart from the camera and it's screening plate installation. through G-6 (from February 1943), and the fact that performance is still noted at Steig- und Kampfleistung (1,3ata, 2600U/min for 1310 PS at SL), and not with Start- und Notleistung (which is in turn 1,42ata, 2800U/min for 1475 PS at SL.,This has been cleared for operational in October 1943), it is reasonable to believe the table dates from around mid-1943. Of particular interest is the notes under the main table, especially the performane gains from the use of GM - 1 boosting. 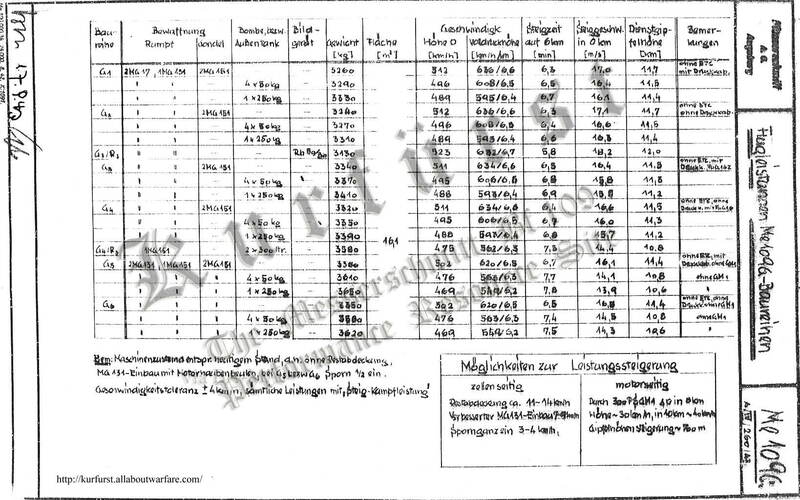 These values are also confirmed by flight testing in the aformenioned Erla report. Beim : Maschinenzustand etspr. heutigem Stand, a.n. ohne Restabdeckung, MG 131-einbau mit Motorhaubenbeulen, bei G5 bzw. G6 Sporn 1/2 ein. Geschwindigkeitstoleranz +/- 4 km/h, sämtliche Leistungen mit ,,Steig-Kampfleistung". Last updated 1 February 2007.